Anxiety is a common complaint among primary care patients. Anxiety disorders are prevalent in the general population; some of which are twice as prevalent in the primary care setting. Despite the associated high rates of health care utilization, anxiety disorders often are not detected or appropriately treated in such medical settings. Brief diagnostic assessment measures, including short clinician-administered interviews and diagnostic patient-screening questionnaires, have been developed for primary care settings. 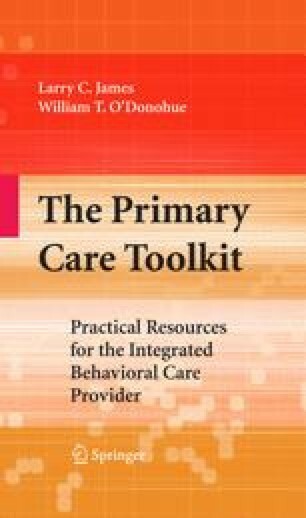 In addition, several accessible therapist treatment guides, patient workbooks, and self-help resources based on empirically supported treatment methods are commercially available. In this chapter, these resources are reviewed after a brief discussion of anxiety disorders in the primary care setting.